More than 150 of Britain’s railway stations are request stops. You have to put out your arm to get the train to stop at the platform. In this series, Paul Merton will travel around the country by train, only getting off at request stops. He’ll explore the history of the stations and meet the people who live and work around them to learn more about at these unusual and often overlooked stations. Premiered on Channel 4 in May 2016 (Sundays at 8pm) averaging 1.7m (6.7% share). Audience skewed older with 42% of the audience over 65, compared to the slot's 25% average. If you like this, you may also be interested in 'Flying Scotsman with Robson Green' and 'Michael Portillo's Lost Railway'. Paul Merton tours some of Britain's many railway request stops - exploring their history and meeting the people who live and work around them to learn more about these unusual and often overlooked stations. 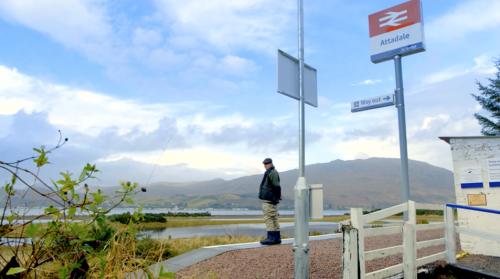 Paul’s journey around Britain begins in the Highlands, travelling on the stunning Kyle Line to the request stop of Attadale. Here he meets Joanna and Alec Macpherson who’ve recently moved from Peckham to Attadale to take the reins of a vast 30,000-acre estate at the shore of Loch Carron. While he’s there he gets stuck in with the local salmon breeding programme. Paul’s next two request stops are on the Cumbrian Coast Line. At Drigg, he manages to get past the barbed wire to access a low-level nuclear waste repository, discovering what happens to the UK’s radioactive waste. And at Silecroft, he dons his running gear and impresses the local fell runners on an evening training session. At Ferryside in Pembrokeshire, Paul meets fellow request stop enthusiast Dixe Wills before fulfilling a childhood dream when he’s allowed in to the station’s manual signal box to learn the skills of the signalman. At his final stop, the wonderfully-named St Keyne Wishing Well Halt in Cornwall, Paul finds magic and mystery at a wishing well that, according to legend, determines the power balance between a husband and wife. Paul explores the new lives and rejuvenation around Britain’s request stops. His first journey is on the glorious West Highland Line, getting off at the request stop of Beasdale. It was here, during the Second World War, that ordinary people would come to be trained in espionage by the Special Operations Executive – ready to be dropped behind enemy lines. He visits Arisaig House, the secret headquarters of the SOE and discovers evidence of what went on there. At St Andrews Road, Paul discovers a request stop which is far from remote. It’s just outside the centre of Bristol and totally industrial. Where once it served the docks and a massive smelting works, it’s now home to a supermarket distribution centre. Paul clocks in for a shift and is baffled by the computer which runs the place. At his final stop, Pontarddulais, Paul sees how a former mining town has reinvented itself – it’s now known as ‘the wedding village’ – with a high street full of bridal shops. 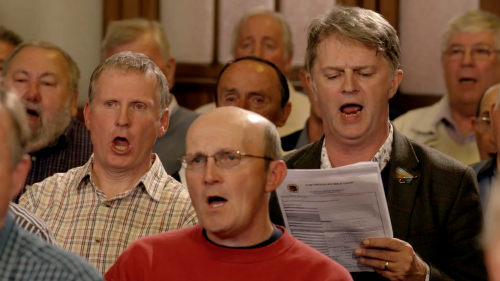 He helps a young bride pick out her perfect dress and has the chance to sing with the local male voice choir – the most successful choir in Wales. In this programme, Paul goes in search of hidden history around Britain’s request stops. He begins on the stunning Pembrokeshire coast, at the request stop of Penally. His mission is to find a series of First World War training trenches, dug by troops stationed at the local army camp to give soldiers heading for the Western Front the skills and techniques they’d need for trench warfare. After the war, the trenches were abandoned – and have only recently been rediscovered. 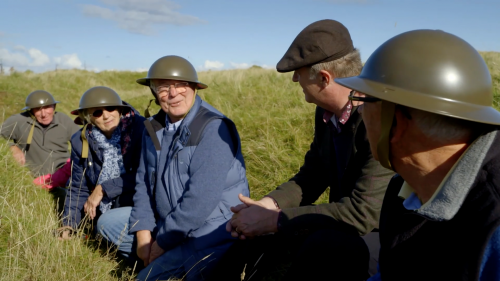 Paul joins the local history group on a tour of the trenches, to get an insight in to what it was like for soldiers 100 years ago. At Luxulyan in Cornwall, Paul goes in search of hidden remains of local china clay mines which once dominated the landscape, but have now been overrun by nature. In Greater Manchester, Paul visits Reddish South - a request stop famous for its lack of trains. There’s only one train a week and it only goes in one direction. Paul manages to flag down the train and travels with two dedicated campaigners who want the line restored to its former glory – when it used to provide a regular link straight in to the centre of Manchester. And for his final stop of the series, Paul visits Corrour on the glorious West Highland Line – the most remote of all his request stops. It’s absolutely in the middle of nowhere – it’s 10 miles to the nearest public road. Paul discovers the story of why there’s a station here at all and takes shelter in a small youth hostel – a boathouse which once belonged to the man who found the Scottish Youth Hostel Association.